The best way to ensure that your building’s air quality is up to par is to schedule a professional indoor air quality test. An air quality test will tell you if there are any toxins, including mold, in the vicinity being tested. Once you know the results, you can remedy any possible air quality problems in the proper manner to ensure that your building is safe. If you’re thinking to yourself that your workplace can’t possibly be contaminated, think again. Some 30% of buildings have indoor air quality problems that lead to a toxic environment for employees and customers alike. Even if you work in a city with high pollution like Los Angeles, don’t assume the air inside your building is better than that outside. Studies have shown that indoor air can actually be up to 50 times more polluted than outdoor air. With this in mind, it’s vital for facility managers, property owners, and business executives alike to be proactive in their planning and preparation. Healthy employees are happy, more productive employees! Is your workplace safe? 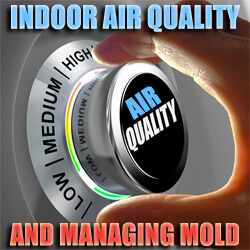 Click to see indoor air quality stats! A healthy office is a more productive office. More and more job applicants are prioritizing the concept of a healthy work environment and health benefits when deciding whether to accept a new job. With this in mind, it’s important to provide a healthy working environment for employees, especially if you want to attract the strongest candidates. 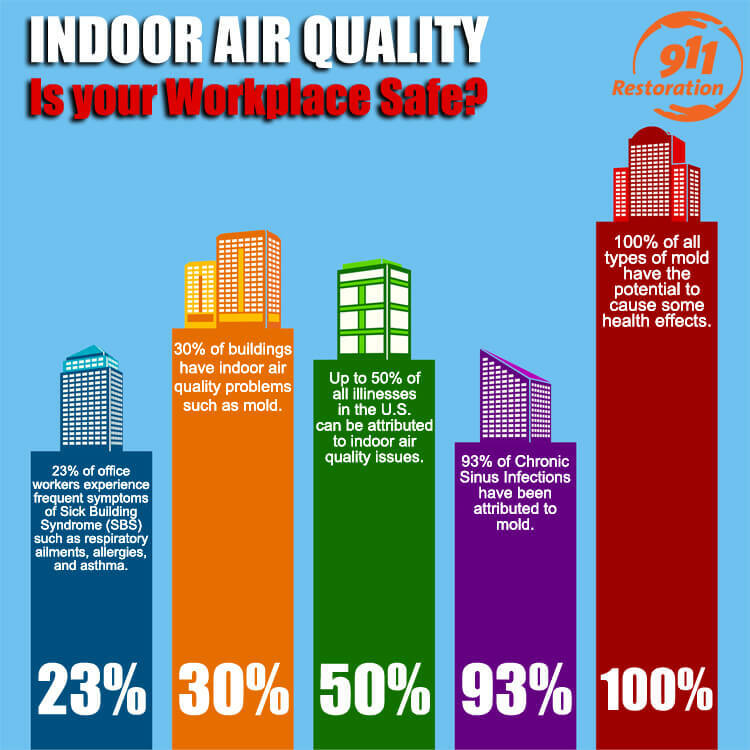 When it comes to healthy working conditions, indoor air quality is the prime variable in keeping employees healthy. A recent study showed that nearly 23% of office workers experience frequent symptoms of “Sick Building Syndrome,” or SBS. These symptoms include respiratory ailments, allergies, and asthma. Sick employees suffering from any of the above symptoms may need to take excessive time off, which is bad for both the worker and the employer. Additionally, productivity will decrease. Also, sick employees run the risk of contaminating co-workers, further diminishing productivity at your facility. Even if a sick employee does come to work, their productivity is bound to be lower than a healthy employee. With mold a real possibility for indoor air quality issues that go unresolved, it falls on facility managers and business owners to remedy any workplace health issues before they worsen into toxic black mold. If you own or manage a facility, you probably already know about the unsightly threat known as toxic black mold that poses great health risks to humans, especially infants, elderly individuals, or those with compromised immune systems. With this in mind, if you manage buildings such as preschools, retirement homes, or hospitals, it’s that much more important to be on top of air quality and mold inspections. If you notice employers, customers, or residents developing mold allergy symptoms such as sneezing, itching, watery eyes, runny noses, or nasal congestion, it’s time to call a professional for an immediate mold inspection. While few deaths are caused by mold itself, there are a whole slew of other potential problems associated with mold, even for your business. Allowing mold to take root in your building can cause major losses for your business. Additionally, mold will eat through the organic materials of your building structure as easily as it chews up your finances. For example, did you know that paint peeling or wood rot are actually precursors to the crumbling support structure of a building and a sign that you have a mold problem? Also, keep in mind that if you do have mold, water damage is likely close because that extra moisture from the water damage leads to mold growth. Furthermore, the sight or smell of mold is a huge turnoff to both customers and employees alike. It can lead to serious health problems as stated earlier. If you think you may have mold at your facility, make sure to get an indoor air quality check from a qualified professional as soon as possible. Once the mold is removed, keep your property clean and make sure to get the air in your workplace tested every other year at least. The fate of your business and health of your employees may depend on it!